9G1AA was the first station in the air in 1993 after 13 years radio silence. After LX and GU, 9G was the third country where the DAGOE foundation keeps a DX-pedition.. In the period of 24 March 1993 till 11 April 1993 we made more than 38.000 QSO's all over the world. With the benefits of this expedition the Dormaa hospital build a complete recovery room. The crew in that period consist of: PA3AWW "Henk", PA3DEW "Rob", PA3ERA "Arie", PA3FUE "Bert" and PAØTUK "Rinus". 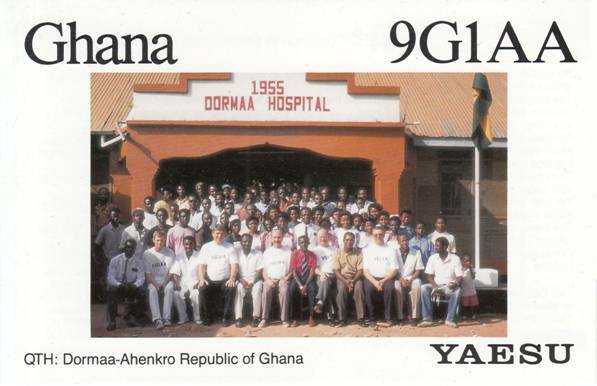 Now 9G1AA is used by amateurs working in the hospital and visiting amateurs from the Netherlands. Once or twice every year Rob PA3DEW en Vincent PA3FQX are visiting the hospital to assist with all kind of technical problems. The decision to go always happens in a short time, so it can't be announced worldwide on time for publication. Arie PA3ERA is the QSL manager of 9G1AA.